When people choose a home, they look at many features such as space for entertaining. What is most important to remember is where you go after the guests leave. When you’ve closed the door behind the last visitor and turned down the lights, you retreat to your master suite. The place you relax and unwind should be stunning and comfortable. custom luxury homes in Austin. They understand that every detail of the home, from selecting an appropriate lot to choosing personalized finishes is important. Their master suites are no exception to the rule. 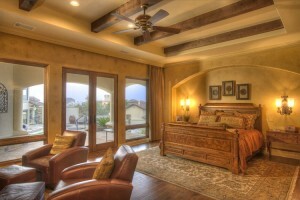 From top to bottom, Sterling Custom Homes can create a sanctuary. High ceilings with wood beams and vaulted ceilings make these already spacious rooms soar. Select your favorite floor covering, whether you prefer the class of wood or the warmth of carpet. Since these homes are built on your lot, you also control the view you wake to each morning. The master spa features beautiful tile and custom showers. Skylights and recessed lighting add a fresh glow. It’s a perfect place to draw a bubble bath and let the day’s worries slip away. Sterling Custom Homes to design your luxury dream home.